Chances are if you’ve ever eaten any pasta whatsoever that the dish included some amount of basil. A prominent member of the mint family, the herb basil has an extensive range of uses. This herb, though simple in appearance, provides a powerful source of vitamins and minerals that serve to optimize many of the body’s daily functions. Extending beyond the role of a culinary spice to an herbal tea, basil has the nutrients necessary for a healthier lifestyle. Human beings depend on vision tremendously for almost every task. As people age, their vision often deteriorates, hindering the ability to do simple things like read a street sign while driving. Providing your body with the proper nutrients can help to impede the degradation of vision. Zea-xanthin, a flavonoid in basil tea, has a beneficial effect on the human eye. When absorbed into the retina, zea-xanthin has been shown to filter harmful UV rays from damaging the eye. Basil tea also has high amounts of vitamin A. Invaluable to the body, vitamin A has proven beneficial for vision and also helps to keep the mucus membranes functioning properly. For those concerned about their optical health as well as preserving clarity of vision, basil tea may be able to help. Basil tea serves as a beneficial drink for the circulatory system for a number of reasons. With a high level of iron, the tea helps to stimulate the production of red blood cells within the body. The tea also contains magnesium, which relaxes the muscles and blood vessels, improving blood flow and lessening the risk of irregular heart rhythms. Basil tea has anti-inflammatory properties that allow it to inhibit certain enzymes. Many non-steroidal anti-inflammatory drugs (NSAIDS) like aspirin and ibuprofen inhibit the same enzymes. For this reason, many people have found that drinking basil tea can help to alleviate symptoms of arthritis and other forms of inflammation. Many people drink basil tea for the tea’s natural ability to relieve mental fatigue and bring about a relaxed state of mind. Basil tea drinkers have reported lower levels of stress overall. People who drink the tea also benefit from its memory enhancing properties. Basil tea contains corticosterone, helpful for the brain as it stimulates cerebral circulation and conditions the nervous system. Directions: To make a delicious brew of basil tea, simply take one tea bag and steep in hot water. For a lighter brew, steep for three to six minutes, and for a stronger brew, steep for seven to ten minutes. Remember not to use boiling water, as studies have shown that boiling basil leaves can significantly decrease the amount of vitamins in the plant. Though already known as a sweet and flavorful herb, honey and/or sugar may be added to your tea depending on the preference of the individual. As with any herbal supplement, remember to talk to a doctor prior to starting a basil tea-drinking regimen. Tea drinkers often swear by their favorite teas. With all of the wonderful things that basil tea can do, even the most knowledgeable of tea enthusiasts would be remiss not to add it to their personal arsenal. 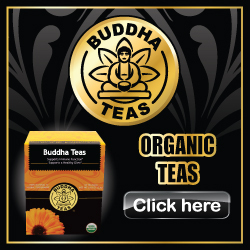 When seeking out the best variety of basil tea, we would look no further than Buddha Teas. With a philosophy that emphasizes eco-friendly production coupled with organic ingredients, Buddha Teas provides basil tea as good for you as it is for the planet. Other tea companies bleach their tea bags, adding harsh chemicals that compromise the tea’s integrity. Buddha Teas never bleaches their tea bags, making their tea as fresh as if you made it yourself. For any further questions or concerns about basil tea feel free to contact us at any time.